Crowdfunded Perk Machine Quietly Circulating Into Production. While the SCA Expo next week will be chock full of fascinating new technologies and launches, in our accelerated world of product development there’s always something even newer in the wings. Crowdfunded Perk Machine Quietly Circulating Into Production. All images courtesy of Perk. 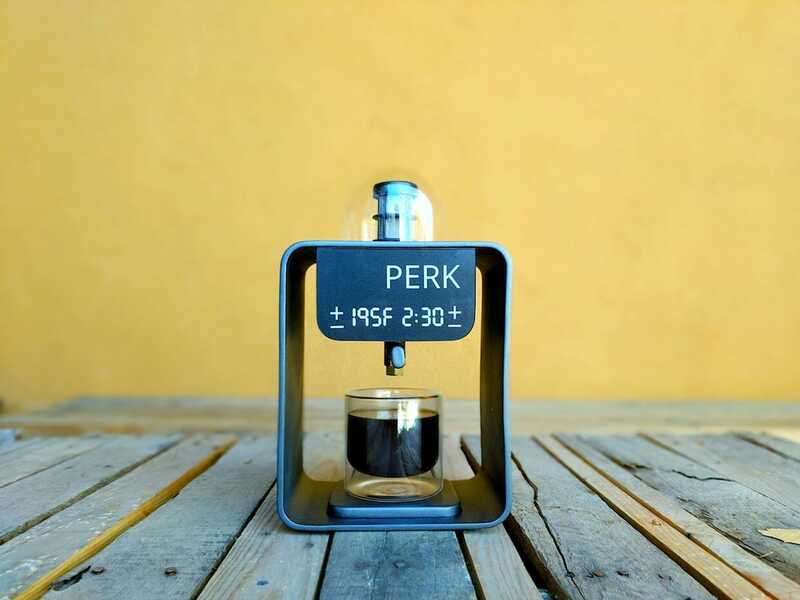 One such development that just yesterday crossed its crowdfunding campaign threshold is the Perk brewer, which has found early and vocal support from the likes of coffee author and consultant Scott Rao, as well as roasters and baristas from up and down the West Coast. The single-cup Perk machine utilizes the re-circulatory mechanics of old-fashioned percolator brewing for a result that the Santa Fe, N.M.-based Perk company says is akin to a pourover in clarity, acidity, sweetness and mouthfeel. With a quiet, durable centrifugal pump and PID heater control, the Perk sends liquid of a precise temperature — water at first, and eventually brew — upwards into a brewing chamber to interact with grounds before it flows back down to repeat the route, for as long as the user chooses. The screen filter and the pump’s head are removable and dishwasher-safe, the pump’s innards play well with detergents and the company claims the machine’s open-boiler design promotes easy descaling as well. The liquid chamber will be coated in ceramic material and will wipe clean easily, according to Svec. The metal mesh of the filter, which in the final version will be stainless steel, is 100 microns in fineness, although Svec said a resulting clear, crimson cup is not due to the mesh filter, but to the propensity of the mass of grounds in this method to self-filter — an efficiency encouraged by the intentional shape and size of the infusion chamber as well as the flow rate of the pump. Early feedback from testers and crowdfunding backers has encouraged Svec to pursue a stalwart, plastic-free construction for the first Perk production model, strong enough not only to support commercial café use but for the company to offer a 1-year warranty to that effect. Subsequent models could feature lower-cost materials for a lower consumer price, though that’s only the stuff of conversation for now, according to Svec. Technically, the flow rate from the pump is another potential variable that users could play around with, although Svec is hesitant to overwhelm users with additional variables. “We may add a secret feature of pump speed,” said Svec, describing it as potentially accessible through combo of buttons that will unlock the settings buried within the touchscreen interface. Crowdfunded Perk Machine Quietly Circulating Into Production. More important, though, will be a set of pre-set brewing programs that users can conveniently toggle through or modify if they like. Svec will be attending the SCA Expo next week, reconnecting with early supporters and expanding his network in the coffee industry. The Perk crowdfunding campaign has another month to go, and promises delivery of final production units to backers by February 2018. After that the retail price for a Perk machine is slated to be $299.